Environmental degradation has put many marine species in danger of extinction, risking damage to the planet's biodiversity. For most people the aquatic environment is a great unknown. Aquariums offer the possibility to study and enjoy these fascinating ecosystems without the need for long and expensive trips. Aquariums are a great educational tool that can raise public awareness about the need to preserve the lives and habitats of aquatic animals, and make people aware of the importance of biodiversity. One of the objectives of a modern aquarium is to publicize the ecology of lakes, rivers, seas, and oceans, as well as their current environmental risk. 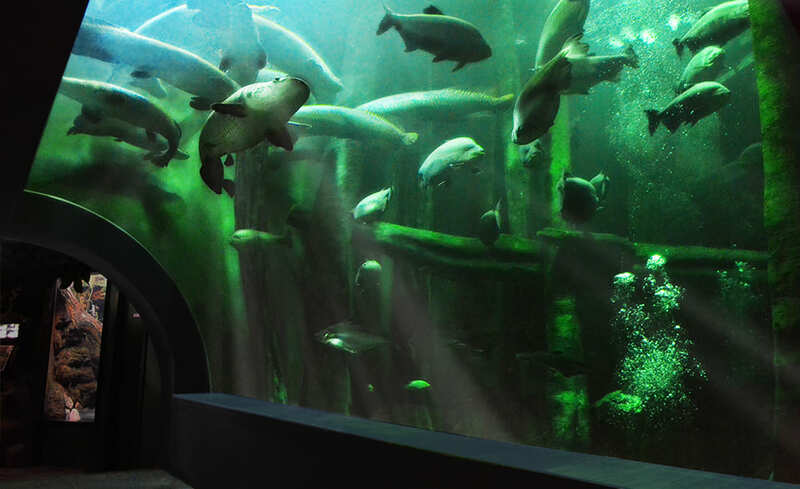 The Fluvial Aquarium of Zaragoza is the largest of its kind in Europe. It has more than 2.5 million litres of water in 70 aquariums and aqua-terrariums. It houses the largest freshwater tank in Europe, with 1.7 million litres of water and a depth of 9 meters, and contains species of freshwater fish from five continents. The aquarium recreates the world's most important river ecosystems: the Nile (Africa), the Mekong (Asia), the Amazon (America), the Murray-Darling (Oceania) and the Ebro (Europe). It hosts over 100 species and 1,000 individuals, respecting their natural conditions. The majority of animals that live in the aquarium are extremely sensitive to changes in environmental conditions. For the fish to thrive, thorough and regular monitoring of various physical and chemical parameters in the water is necessary. In each system, a suitable range is defined for these key parameters. These are maintained within appropriate levels through filtration systems and regular water changes, biomass control, and maintenance of the systems. Thanks to the collaboration between Libelium and the Aquarium of Zaragoza, measurements at the freshwater aquarium and a terrarium are taken several times per hour instead of once a day. The main goal of the water-monitoring project is to automate the measurement of physical and chemical parameters in the tanks, improving the reliability and frequency of the data collected, and simplifying the tasks of the Aquarium of Zaragoza staff. Every five minutes, the Smart Water sensors installed by Libelium measure different air and water quality parameters in the aquarium and the terrarium. Data is captured and digitized by Waspmote. Two different nodes located in the same zone send values to the Meshlium Internet Gateway via long-range 868MHz band. Meshlium, Libelium's multiprotocol router, is used in this project to gather all the data from the sensor nodes and transmit them in the Cloud. In this project, Meshlium also stores all the data internally to build a data historic. Aquarium technicians can access this data in real time to know the status of the aquariums and terrariums and correct any anomalies. The diagram above shows the probes, the nodes, the sensor network and its connection to the Cloud. 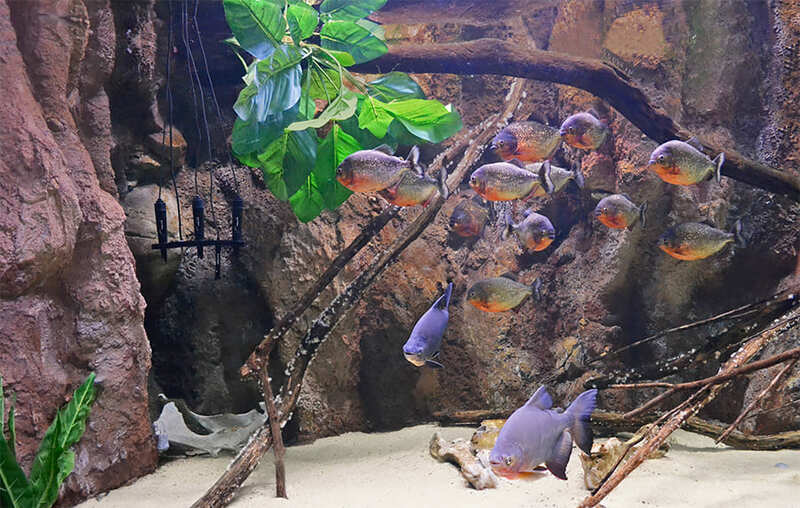 In the freshwater aquarium, a recreation of the Amazon River, more than 20 piranhas (Pygocentrus nattereri) and 3 false piranhas or pacús (Colossoma macropomum) live in 13,300 L of water. The physico-chemical properties of this tank are soft and acid waters, typical of this great river. The selected solution for the freshwater aquarium was Libelium Smart Water. It can be used to monitor different parameters related to water quality such as temperature, pH, Electroconductivity or Dissolved Oxygen in water, among others. Monitoring these parameters helps aquarium technicians ensure animal welfare. 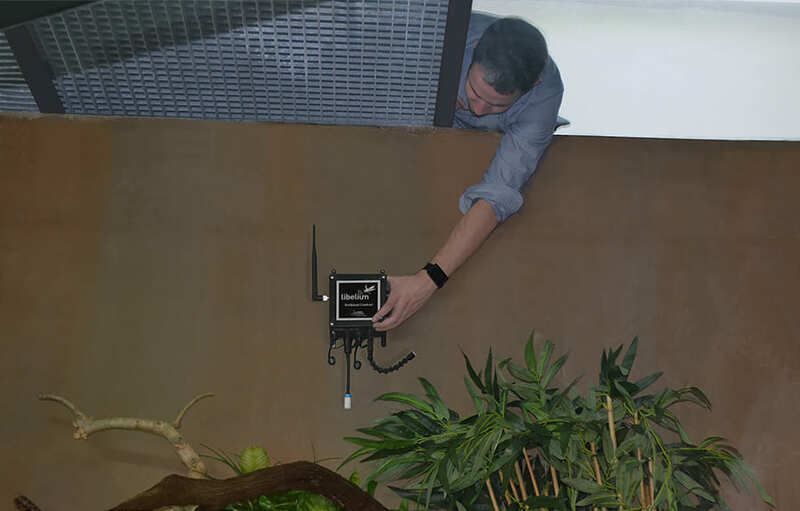 "Changes in the optimal conditions of both types of aquatic environments can be detected now in minutes, ensuring the quickest reaction of the aquarium team. Waspmote Smart Water is the first water quality-sensing platform that connects to the Cloud for real-time water monitoring,” said David Gascón, Libelium CTO. 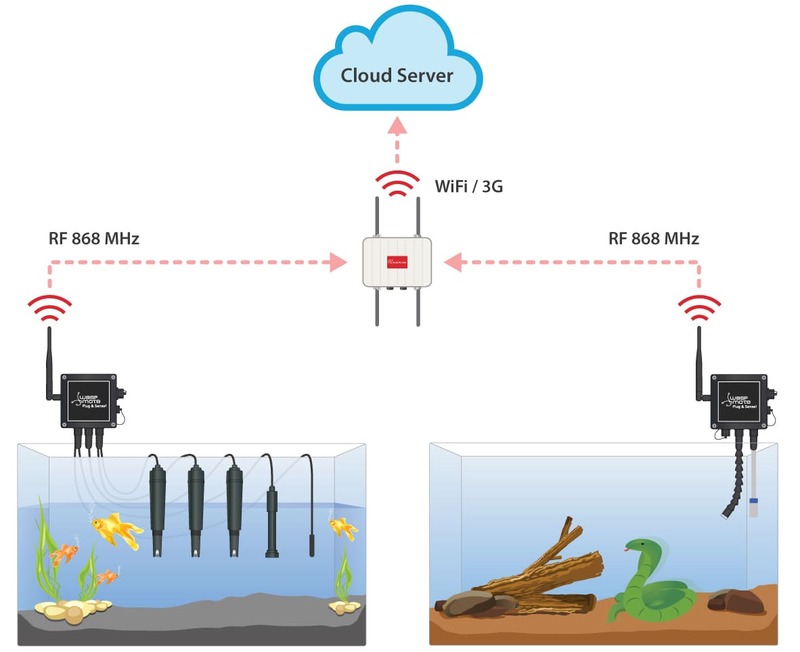 "The wireless sensor network we have deployed in the Aquarium of Zaragoza simplifies remote water and air quality control." The complete range of Smart Water sensors available for Waspmote and Plug & Sense! platforms include: pH, dissolved oxygen (DO), oxidation-reduction potential (ORP), conductivity (salinity), turbidity, temperature and dissolved ions (Na+, Ca+, F-, Cl-, Br-, I-, Cu2+, K+, Mg2+, NO3-). In the terrarium, also located in the Amazon River area of the aquarium, live an Anaconda and seven different fish species offspring. Nearly 300 specimens from eight different species, living in harmony in 8,000 L of water. 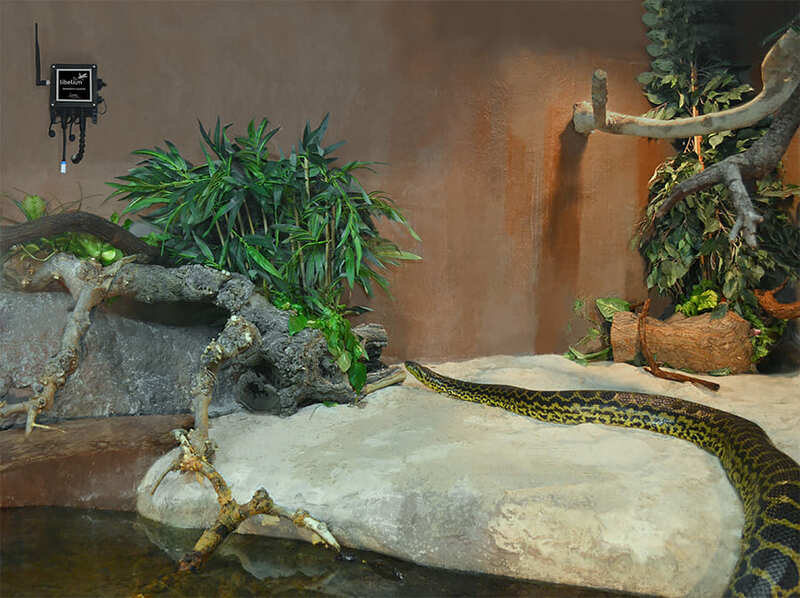 For this snake weighing over 25 kilograms and nearly 3 meters in length, a specific measurement of humidity, temperature and luminosity is required. The solution chosen for this installation was Ambient Control. This specific Plug & Sense! 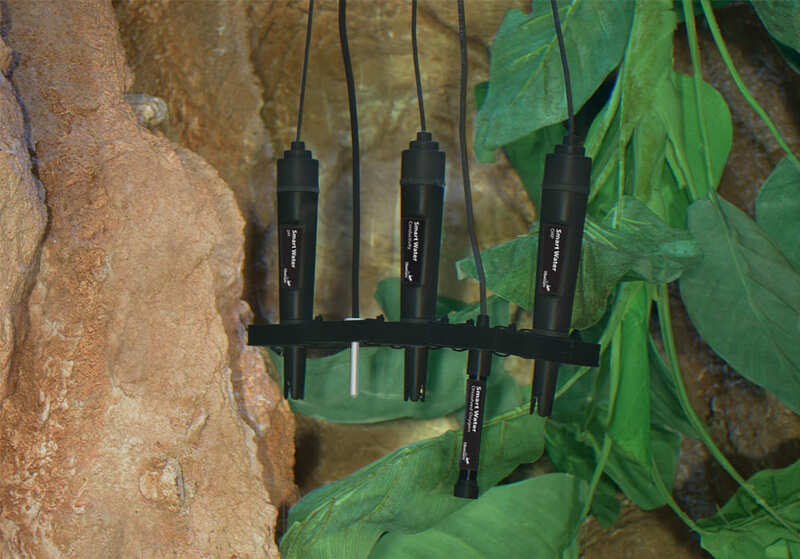 model monitors basic environment parameters using temperature, humidity and luminosity sensors. One of the main challenges we encountered during the Aquarium of Zaragoza project was to place the devices without disturbing the animals. A key point was to affect the animals’ environments as little as possible. Libelium collaborated closely with the Aquarium of Zaragoza technical staff to find the best location for Ambient Control in the terrarium. TH (Temperature and humidity): Temperature and humidity in the terrarium. 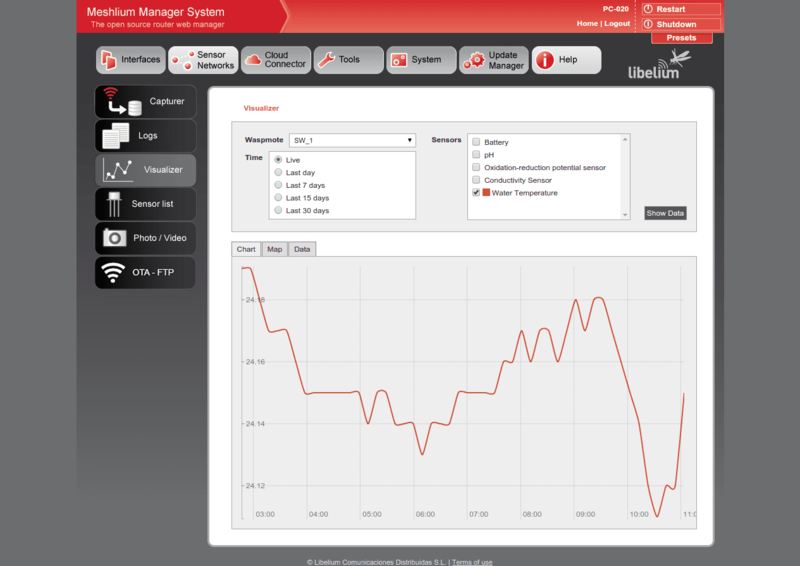 "The advantages of the real time control system are endless compared to the traditional systems. Now we can monitor the entire Aquarium from a smartphone, and we are saving money every day," said Javier González, Aquarium of Zaragoza Technology Director. "Having a data measurement record is clearly an additional advantage. Now the data is stored automatically without any effort on our side." It is possible to check remotely in Meshlium all the data taken by the nodes. You can find in the screenshots below two examples of monitored data: Water Temperature and Conductivity. Clic to enlarge. Biodiversity is fundamental to human existence on Earth and used in a sustainable way, is an unlimited supply of natural resources, providing many essential goods and services to society. It is closely connected also to the health and welfare of people, and is key to social and economic development. It is the task of all of us to protect our environment, to act sustainably, to learn about and care for the species that make up our essential aquatic ecosystem. For more technical information about Smart Water read the Smart Water Technical Guide .